I grew up in Richmond, Virginia, but bussed 35 miles each day to a performing arts high school in the town of Petersburg. Several times a week during the spring, I’d get out of class early with the rest of the girls on the varsity tennis team, and we’d haul our bulky bags onto a bus for our away games, motoring down U.S. Route 460, the through-line that connected all the schools in our district. We barreled through small town after small town in the rural depths of Southern Virginia. But when we’d approach this one town, Wakefield, all the time I spent on a rickety school bus became worth it. First, my best friend lived there. And it was an excuse to visit the Virginia Diner, home to my favorite pie in the world. The Virginia Diner started in 1929 as a refurbished railroad car on the side of the road. A woman named D’Earcy Davis served hot biscuits and vegetable soup out of the railcar, and her business grew from there. Now, the Virginia Diner is a wide, white building that stretches alongside the highway. It’s a requisite entry in any Virginian guidebook. It’s unmissable, even from a distance: The red letters against the white siding stand out amid the brown and green of the countryside. I’m not a dessert person. I’m more likely to wax poetic on a perfectly braised pork shank than a slice of chocolate cake. But aside from seeing the word “ham” so many times on a sheet of paper, what stuck with me from the Virginia Diner was this strange dessert known as peanut pie. The menu boasted its reputation by referring to it as “World Famous Peanut Pie,” but I was wise enough to know that plenty of restaurants decide something is “world famous” simply by stating it as such. But upon first bite, all skepticism faded. This pie was different—and damn good. It immediately became number one in my world. But then, I graduated from high school. I left for college in the Midwest, and it immediately hit me: Almost no one outside Virginia had heard of the peanut pie; ipso facto, it was literally impossible to find a slice anywhere else. If a craving struck me in Brooklyn, I had to make it myself. That’s not the worst problem—peanut pie is deceptively easy to make—but it never quite tasted like home. Bearing little in common with its one-word-off cousin, peanut butter pie, peanut pie is closer in spirit to a pecan pie. It’s crunchy atop, with a corn syrupy smoothness beneath the peanut layer. It’s slightly saltier than a pecan pie and hits the same salty-sweet spot as peanuts mixed with Coca-Cola, another Southern concoction I discovered. The pie has a golden brown color and is best when set firm around the edges of the crust and looser toward the middle. The Virginia Diner’s recipe is far from a proprietary secret. Martha Stewart recreated it, though her take favors a fancier preparation. 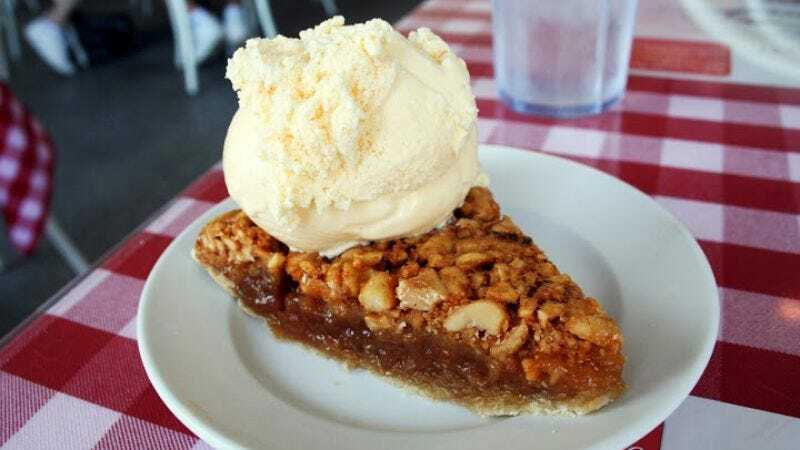 The real deal—and the one at the Virginia Diner is the real deal—is simple: coarsely chopped or crushed roasted and salted Virginia peanuts, sugar, eggs, flour, corn syrup, and butter mixed together and poured into a pie crust before going in the oven. Although it refers to itself as “the peanut capital of the world,” the Virginia Diner hardly invented peanut pie. The dessert’s history goes back to when peanuts first arrived in America, introduced by African slaves. Peanuts became a commercial crop in Virginia first in the early 19th century, grown for oil, food, and as a cocoa substitute. Because of the nut’s association with slaves, it was stigmatized, and considered a lowly food. (The phrase “peanut gallery” was used to describe the theater section with the cheapest seats during the vaudeville era.) But within slave communities, peanut dishes prospered, including peanut stew, which has roots in West Africa, as well as peanut pie. Peanuts were eventually embraced more widely, shelling their previous stigma, and peanut pie made its way around the South. “Here’s a dessert to make even your deepest-dyed Yankee start complimenting you with a southern accent,” boasted a 1940s advertisement for Karo that champions the corn syrup brand as peanut pie’s key ingredient. The ad included a recipe for “Deep South Peanut Pie,” which looks a lot like the no-frills Virginia Diner approach. Some variations on peanut pie—including Martha Stewart’s—add cayenne to the mix for a subtle spicy finish. I’ve also come across peanut pie recipes that call for chocolate chips, vanilla extract, or bourbon. I usually make mine with brown sugar, which blends with the corn syrup for a slightly more molasses taste and creamier texture. Typically, one of the biggest variables is the peanuts. If you encounter a North Carolina peanut pie, for example, that probably just means it’s made with North Carolina peanuts. Now, surely I’m biased, but Virginia peanuts are tops in my book, which I find to be the largest and crunchiest, making them ideal for the top layer of peanut pie. Virginia Diner gets it right by keeping it simple. Peanuts are cheaper than pecans, making peanut pie a more economical alternative, and its status as a delectable dessert (without breaking the bank) should be preserved. I often make impulsive and lengthy trips when I’m home in Virginia for the sheer sake of food nostalgia. Once I drove the 40 minutes from my house to Petersburg not to visit my old high school but to hit up a barbecue joint run out of an old railcar. It served the best baked beans I’ve ever had—worth every gallon of the 70-mile round trip. Another time, I took a roundabout route to Virginia Beach, adding an extra hour of travel to my journey for one reason only: I wanted peanut pie from the Virginia Diner. I like making the pie myself, but it’s hard to beat the original, which, besides getting the crunchy-creamy consistency balance perfectly, reminds me of long, warm bus rides with the tennis team, the early days of my love affair with Virginian cuisine, and the sprawling country road.